In and around the Kaihu valley, north of Dargaville, grew some of the largest kauri ever known. East of the valley was Tutamoe Mountain where Kairaru, the largest kauri reliably measured, grew on a southeastern spur. North of the valley is Waipoua forest, containing the largest known trees today. Trounson Kauri Park, most of which was donated by James Trounson circa 1919, lies in the north of the valley and contains the densest remaining kauri dominated forest. The current Trounson Kauri Park, a few kilometers north of current day Kaihu (known as Oponaki /Opoanke until around the end of the 19th century) has concealed the memory of the first kauri park in the region, also partially donated by James Trounson around the turn of the 20th century. Called variously the Maungatu Reservation Park, Kaihu Kauri Park, Kaihu Forest Reserve, and even “The Peoples Park” , the reserve consisted of around 3 hectares of trees purchased by the government in 1890 (possibly as a land swap with the Mitchelson Brothers ), with an additional 10 or so hectares donated by Trounson a few years later, certainly before 1903. Described as anywhere from three, five, nine or ten miles by road from Kaihu, the park was adjacent to Trounson’s own forestry and milling operations in the Wairau Bush. One of the reasons for the reserve was that it contained the largest known tree in the country at that time. A contemporary reference labels the tree as the Maungatu Kauri. 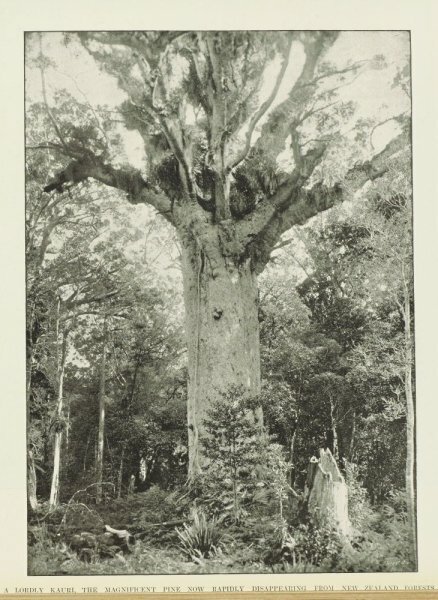 Sale labeled the tree as the “Trounson big kauri or the great kauri tree of the Kaihu Forest” , along with a photograph of the tree, taken by Josiah Martin of Auckland. Martin was not the only person to photograph the tree. 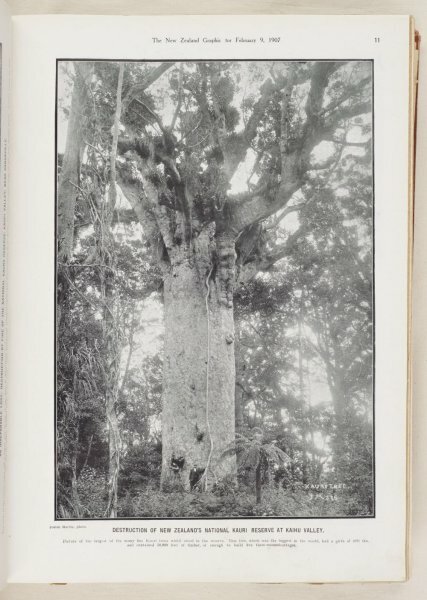 A number of photographs of the tree are held in the online collections of the National Museum, the Auckland Library heritage collections, and the Auckland Museum. All show a massive trunk extending with little taper to a mass of huge, horizontal branches. Contemporary references to the girth of the tree range from 49 feet 6 inches (15.1 m, or a diameter of 4.81 m), to a somewhat exaggerated 78 feet. Sale states the girth as 15 to 16 m, with a bole 12.5 to 15 m to the first branch, little taper (5%) and a timber content “perhaps a little bit less than that of Tane Mahuta”. A contemporary reference has the timber content as “50,000 ft” (presumably board feet, or 118 cubic metres, sawn). This is a somewhat underestimate of the size of the tree. At a girth of 15.1 m, a bole of 15 m and a taper of 5%, the total volume of stem timber would actually approach 260 cubic metres, or about the same as Tane Mahuta. As measurements of total height and crown spread were not important to the timber industry at the time, such measurements were not available in contemporary references to the tree. 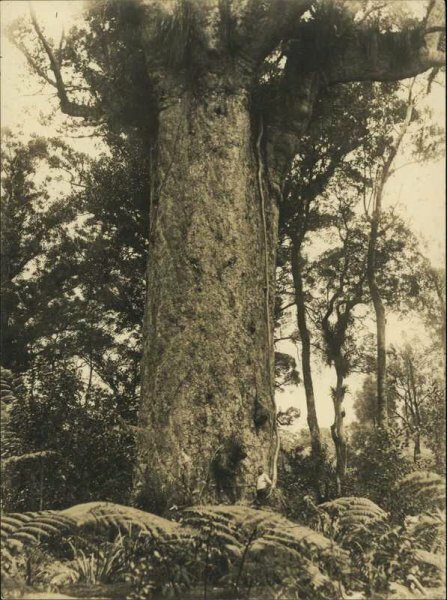 As a conservative first approximation, a crown with a spread of 30 m and a height above the first branches of 25 m (both typical for the largest kauri trees) would result in a height of approximately 40 m.
The Kaihu tree appeared to be in magnificent health at the start of the 20th century, with no major loss of limbs or dieback. However, the removal of the surrounding forest exposed the tree to further risk. In late January 1907, fire spread from neighbouring cleared land to the surrounding bush, consuming some of Trounson’s forest, and around half of the 20 acres of the reserve, including this magnificent tree. Trounson later donated a further amount of the neighbouring forest to form the current day Trounson Kauri Park. That is a treasure today, but sadly absent what was the largest known kauri tree at the start of the 20th century. New Zealand Herald, Volume XLIV, Issue 13400,, 31 January 1907. “The Awakening of the North,” New Zealand Herald, Volume XL, Issue 12186, 4 February 1903. The New Zealand Graphic, p. 730, 20 September 1902. The New Zealand Graphic, p. 1147, 25 April 1903. Based on known bole plus typical crown for large kauri. Was in its prime when killed. Massive 15 m bole with little taper. 13 Jun 2016 Smillie, M.J. The tree was located in the original reserve near the current day Trounson Kauri park. The actual location is not known, but is thought to neighbour the existing Trounson Kauri Park and adjacent the old Kauri Park Road.